When the 1994 Genocide started, Tutsis who feared being killed, flocked churches and other places of sanctuary but many did not survive. Killers could force their way in and thousands were massacred. Others were fed to the killers by the men of God. However, hundreds of Tutsis who had taken refuge at Saint Paul Church in downtown Kigali found a safe haven courtesy of then Father Celestin Hakizimana. Hakizimana, who is now a bishop, welcomed whoever came to him and committed to do all he could to protect them. The first thing that came to his mind was that the people were innocent and deserved protection. "I believed they were innocent and only deserved protection," he told The New Times in an exclusive interview held in Nyamagabe town in Southern Province. He is currently the Bishop of Cyangugu Diocese. Hakizimana says that at the height of the Genocide, he managed to convince security guards who worked at the church not to allow the marauding militia onto the church premises. This, he said, was not an easy task, given that the Interahamwe already knew that thousands of Tutsi were hiding there. "I could stand at the gate in my robes, face the Interahamwe militia and tell them that we had no enemy but innocent people. If they wanted to fight the enemy they should go to the battlefield," he notes. "Everyone stayed indoors, terrified. We fed them and found water for them to drink and wash and children were given special care. We had enough stock so we were lucky that we didn't run short of food," he added. However, it was not enough for him to feed them and his protection was not granted. Hakizimana had to deal with several Interahamwe attacks that left him threatened every time they came, leaving him unsure if he would be successful the next day. "Sometimes I paid them off to leave without killing anybody, I also offered them food and drinks as a price though sometimes they returned and picked people whom they killed," he says he managed to protect them until mid-June. He remembers on a single day, they came on three different occasions; once the militiamen came and took about seven people, another time they took twenty while on another they took 50 people. All of these were killed. "Then another time they came in huge gang from Kiyovu, Rugenge and Muhima sectors some wearing military fatigues while others adorned the Interahamwe attire of African print (Kitenge), equipped with fire arms and traditional weapons," he says. "They came with a list of 20 people they wanted but I told them we did not have those people, I challenged them that the list was also not signed but they took it and got it signed," he says. Hakizimana had registered everyone at the church but he hid the list and could present another one with made up names. Most of the people were well known and top targets by the killers. "When they came back with a signed list, they entered the church but could not see those they wanted, they picked about 20 men, tied them up and they killed them from the nearby Rugenge Sector," he narrated. Hakizimana still remembers that only one person survived. "After they killed them, they came to PanAfrique hotel that was nearby and held a party that they had killed Tutsis". "Whenever they took people it was a crisis; people became hopeless, the worst day was when Interahamwe took over 50 of the youth. Their parents begged to be taken instead. We had to give those who remained counselling sessions and prayed together. It was a serious issue to deal with. He said that as days went by, the militiamen got more and more vicious and the prelate says he knows he did not have much time left to offer protection to these people let alone for himself. "We were left in sorrow and waited to also be killed, the most unfortunate thing was that 10 days after that attack, the others rescued," he added. During the night of July 16, Rwanda Patriotic Army soldiers planned an operation that rescued the over 2,000 Tutsi who hid at St Paul. For this cleric, the soldiers were "God Sent" as they saved lives of many who could have been killed as the Interahamwe were becoming more violent. "What I thank RPA soldiers for is their resilience, the courage and professionalism they exhibited to snake through Saint Paul despite roadblocks by FAR soldiers and Interahamwe who fought them," he said. "We would all have been killed in less than a week hadn't it been RPA soldiers, we also remained with little food and we were running short of water, you see, the two months we spent was a long time," he says. Despite the successful rescue operation and the Tutsis who had survived were receiving care and treatment by RPA soldiers, it was a different story from Radio Television Libre de Mille Collines (RTLM), an extremist station. "After the Genocide, when peace had been restored, we would with those who survived, hugged and laughed as we reflected on the period. "It is always a time of joy, we would support each other and nobody wanted to cry again," he said. He said that many survivors have over the years offered him cows. "I have received at least 10 cows while others have offered me money and other gifts to thank me," he said. He said that he has also received a medal in recognition of his effort to protect his flock. Hakizimana was just one of the very few priests who stood between their flock and the killers. The case was different for his colleagues; while some chose to either send away those that ran to them for protection, others openly worked with the militiamen to kill those that had ran to them. Hakizimana says that there was no direct incitement by the Church for the clergy to commit the Genocide, there was a glaring role by some of his colleagues, whom he insists did it in their personal capacities. He gave an example of Fr. Athanase Seromba of Nyange Parish who ordered that a bulldozer demolish church killing over 3,000 who had sought refuge there. Seromba was convicted and handed a life sentence by the UN backed International Criminal Tribunal for Rwanda (ICTR). There is also Wenceslas Munyeshyaka who was the parish priest at Sainte Famille Church, just a few metres from Saint Paul. Munyeshyaka was notorious and worked closely with the Interahamwe militia as well senior government and military officials at the time, and they were always seen together at the church premises. According to survivors, Munyeshyaka, who to this date continues to carry on his clerical work in Franch, used to carry with him a pistol tucked under his sleeveless camouflaged flak jacket and behaved like militia. He was ruthless in his sermons and talked all sorts of evil things, calling the Tutsi 'cockroaches' that deserved nothing but death. Though Bishop Hakizimana can't accuse anybody openly and leaves the matter to justice, he says that some priests forgot what they stood for and associated themselves with the killers. "Some priests failed to honour their oaths and turned against their flock. There was tension in the 1990s and some priests harassed Tutsis calling them names. Their role in the Genocide did not come as a surprise, the mistake priests made was that they failed to dissociate themselves with Interahamwe and befriended extemist politicians," he said. "For the case of Munyeshyaka we had some disagreement. 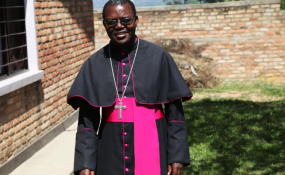 There was a time when people who had fled to Sainte Famille were attacked and I opened the small door as a shortcut but Munyeshyaka wondered why I wanted to protect Tutsis who were fleeing nothing," narrated the Bishop. "Munyeshyaka is a suspect because he befriended genocidal forces and government officials. Second, he behaved like a soldier and could be seen with bullet proof jackets and carried a pistol. He once asked me why I did not get a gun to protect myself but I told him I was not a soldier. He would harass Tutsi priests in public calling them cockroaches. For Seromba, the bishop says he was ruthless by nature and was always proud that he originated from Gisenyi area where most of the senior government and military officials came from. "He could call people RPF accomplices, and during the Genocide he continued collaborating with soldiers. It was his nature, it was a personal weakness that he grew up with," he noted.